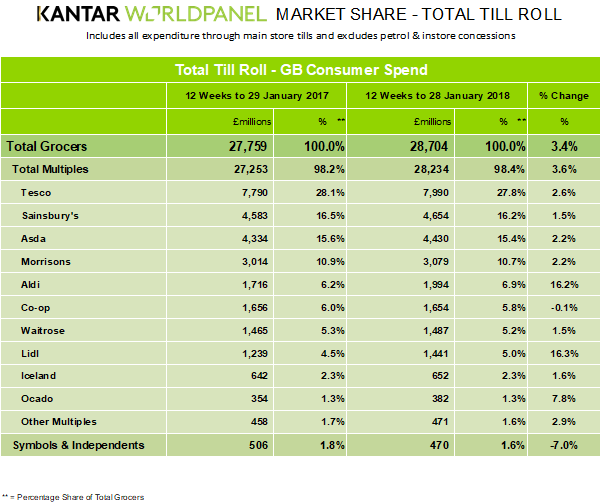 The latest Kantar Worldpanel market share data for the UK market, for the 12 weeks to 28 January, has indicated that Lidl and Aldi remain the UK's fastest-growing retailers, posting growth of 16.3% and 16.2% respectively. Aldi has consolidated its place as the UK's fifth biggest supermarket, sitting on 6.9% share, while Lidl is fast gaining on seventh place, with 5.0% share. Seventh placed Waitrose is on 5.2% market share. “Traditionally focused on own-label lines, Lidl has actually seen fastest growth among its branded products, which are up by 28% and now account for 12% of all sales," said Fraser McKevitt, head of retail and consumer insight at Kantar Worldpanel. All of the UK's Big Four retailers grew their sales in the period, with Tesco up 2.6% to sit on 27.8% market share; Sainsbury's seeing a 1.5% rise to sit on 16.2% market share, Asda up 2.2% to 15.2% market share, and Morrisons also up 2.2% to 10.7% share. 'Although its market share fell by 0.3 percentage points to 27.8%, Tesco still remains the fastest growing of the big four, with sales up by 2.6%,' Kantar Worldpanel said. 'Despite shoppers increasingly opting for vegan options, such as the grocer’s new ‘Wicked Kitchen’ range, Tesco saw the greatest sales growth from its dairy and produce lines. Grocery inflation now stands at +3.6% for the 12 week period ending 28 January 2018, Kantar Worldpanel said. Prices have been rising since the 12 weeks to 1 January 2017, following a period of grocery price deflation which ran for 30 consecutive periods from September 2014 to December 2016. Categories in which prices are rising the most include butter, fresh fish and skin care. Prices are falling in only a few markets, including laundry detergents, washing up products and fresh poultry. “Following a record-breaking Christmas, January saw customers rein in their spending, with shoppers spending £1.6 billion less in the grocers compared with the month before," McKevitt commented. © 2018 European Supermarket Magazine – your source for the latest retail news. Article by Stephen Wynne-Jones. Click subscribe to sign up to ESM: The European Supermarket Magazine.